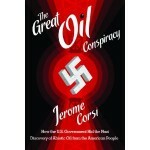 So a new book about oil, “The Great Oil Conspiracy: How the U.S. Government Hid the Nazi Discovery of Abiotic Oil from the American People” by New York Times bestselling author Dr. Jerome Corsi, asks how did the dinosaurs that died and became part of those “fossil fuels” get to be tens of thousands of feet under the surface? Corsi explains that at the end of World War II, U.S. intelligence agents confiscated thousands of Nazi documents on what was known as the “Fischer-Tropsch Process” – a series of equations developed by German chemists unlocking the secrets of how oil is formed. He reports when the Nazis took power, Germany had resolved to develop enough synthetic oil to wage war successfully, even without abundant national oil reserves. After the war, while the Russians saw through the technical equations and realized that the process for “making” synthetic oil is the same process that nature uses to make oil deep inside the earth, U.S. scientists buried the documents and hid them from the public. For decades, those confiscated German documents remained largely ignored in a United States where petro-geologists and petro-chemists were convinced that oil was a “fossil fuel” created by ancient decaying biological debris. Not without reason, Corsi explains, since big U.S. oil companies had no financial interest in explaining to the American people that oil was a natural product made on a continual basis deep within the earth. If there were only so many fossils in geological time, there could only be so much oil. Big oil could then charge more for a finite, rapidly disappearing resource than for a natural, renewable, and probably inexhaustible one, he writes. Corsi took to the airwaves last night, on Coast to Coast AM, which airs on more than 560 stations in the U.S. as well as others in Canada, Mexico and Guam, to explain the evidence he has uncovered. His interview has been posted on the show’s website. For example, the Bakken Formation, which was found in the 1980s and 1990s, initially was thought to have only a minor quantity of oil between layers of shale and sandstone. The issue, he said, is not that the National Archives in Washington contain documentation on the Nazi Fischer-Tropsch process for making synthetic oil from coal, as well as suggestions that oil, in fact, is a renewing resource that could power the world far into coming generations, but that the U.S government has known about the information for years, and has kept it concealed. “The … ‘conspiracy’ at the heart of the book is not that the Nazis learned how to make synthetic fuel, but that the Fischer-Tropsch equations (that the Nazis developed to produce synthetic oil) unlocked the secret of abiotic oil and explain how the earth produces oil naturally, without organic material, at deep earth levels on a basis that is continuous, even today,” Corsi said. “The Nazis understood that oil is a renewable resource, and the U.S. government and Big Oil hid that from the U.S. public – fostering on an uneducated U.S. population the idea that oil is fossil fuel that eventually will be gone — the ‘peak oil’ theory,” he said. There wasn’t an entirely unanimous opinion about the process and its benefits after World War II. 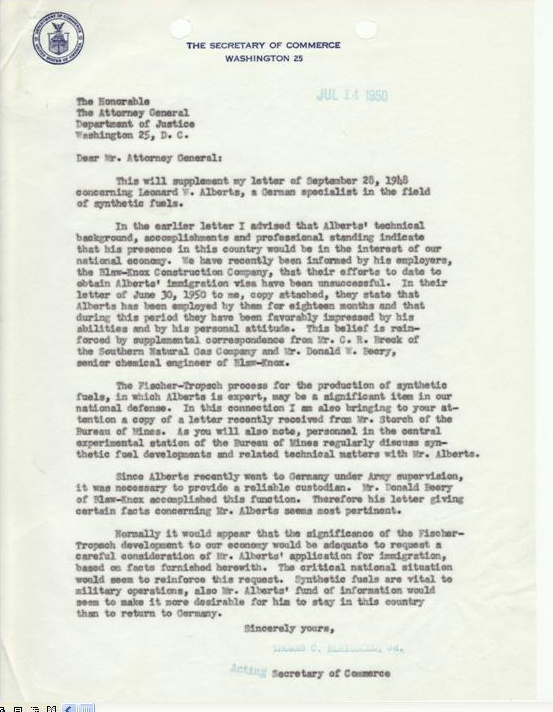 A secretary of commerce in 1950 wrote to the U.S. Attorney General advocating for the admission to the U.S. of a scientist who had worked on the process. “The Fischer-Tropsch process for the production of synthetic fuels, in which [Leonard] Alberts is expert, may be a significant item in our national defense,” the official wrote then. That argument, however, was not persuasive enough to convince the U.S. to take the German work and build on it immediately. “Rather than study the Fischer-Tropsch equations to unravel the code of how hydrocarbons are produced, U.S. petro-scientists and petro-geologists remain happy … to [consign] the Nazi documents to obscurity because they consider synthetic oil production basically a waste of time,” Corsi said. “We have determined that Titan’s methane is not of biological origin, so it must be replenished by geological processes…,” wrote Dr. Hasso Niehmann of the Goddard Space Flight Center. So what are the geological processes? “If Peak Oil theories are right, why do we have more worldwide oil reserves today than every before?” Corsi’s book asks. He notes the Department of Energy and others assessed in 1980 the worldwide proven oil reserves were about 645 billion barrels; but by 2005 that was 1.28 trillion barrels. Corsi explains simply that when hydrogen and carbon are added to coal, with various catalysts under intense pressure and heat, hydrocarbons are produced. That’s simply what the mantle of the Earth does, he said. He said it doesn’t take dead plants or animals, dinosaurs, plankton, algae or former living matter to produce oil, and the Nazis understood this. 14 Comments on "How did dinosaurs get miles under the earth?" I was under the impression that oil was compressed algae not “dead dinosaurs”? Um because we’re at peak perhaps? How in gods name does a guy get a book published when they are this dumb? So what is the feedstock, pray tell, of this abiotic process? Gold, perhaps? His next book will be all about alchemy. “Corsi explains simply that when hydrogen and carbon are added to coal, with various catalysts under intense pressure and heat, hydrocarbons are produced.” Wouldn’t this process take intense energy? Except we have filled them with salt water now, which may have an effect. I am really surprised those conspiring oil companies would do such a thing. I’m not clear on the motive behind the conspiracy at all, honestly. Or about where the coal in the process supposedly comes from. My understanding was that it cones from an era 500 million years or so before the dinosaurs, maybe more. Some Nazi Scientists also believed the Earth was hollow. The fact they believed it was true doesn’t make it true. Indeed there maybe abiotic oil; however, the vast majority of what we use has been proven to be of biological origin. The idea that the Earth is some sort Gas Station we can fill up at our leisure is ridiculous. What BS! As the industrial age comes to an end, due to resource depletion, you’ll see more and more propaganda, like this. I saw this story earlier today. As soon as I saw the ‘dinosaurs’ bit, I knew I was in for a few good laughs. As someone else said, it’s amazing that people this dumb can get their books published. There’s so much idiocy in the world, but I never fail to be shocked at the fact that there’s always an idiot that raises (or is it ‘lowers’?) the bar for idiots everywhere. If oil is a renewable resource, why doesn’t it renew? Why is oil from the older fields dribbling out rather than continuing to rush out under immense pressure like it did in the old days? Some ‘secret’ when you easily get the chemical chain for it in about 30 seconds. Even wiki gives the reasons for CTL. High cost, complex, high-maintenece. They also note that modern plants are 25-50% efficent. Subract the energy costs of useing frak gas, or mountrain removal coal as a feedstock, and its pretty clear the EROEI is not going to be very good. Secondly, Methane on Titan is not evidence Gawd exists and the earth is flat and 4000 years old. Methane conists of 4 H2 molecules and 1 carbon. Both are common in solar system and hydrocarbon type gases are not unique to earth. Oil fields always produce far more than estimated. The big ones always get bigger. The oil, if it is being produced in the earth somehow, percolates upward. This may be a slow process, slower than we can drain it from the well head. As wells go deeper, and there are pay zones beneath the bakken in North Dakota just as there are pay zones under most large fields, they are finding diminshed or no organic compounds in the crude. The organic compounds so familiar with most crude may have been dissolved into the oil as it found places to accumulate in porous rock created from decaying organinc forests etc. Obviously oil does gush, but we dont have gushers because of well head control. All wells gush. Turning your back on developing science is not a good idea. Dismissing what is true is not being honest with yourself. In fact its helping with the self fulfilling prophacy of peak oil, which is a creature of politics. So, as I understand it, the Fischer-Tropsch process is used all over the world, even by the US Military, and in total about 300,000bpd OIL EQUIVALENT (note the emphasis) is produced, and this is for specialised uses only. Firstly, the process requires a carbon input, either coal or natural gas are most common as was the case in WW2 Germany (they had lots of coal), so that doesn’t really make it abiotic, and there are issues with coal and natural gas that I need not go into here. Next, is the huge, and I mean REALLY huge amounts of energy required in order to get the temperatures and the pressures required for the process to work (think EROEI), and then, even with todays high oil prices, it is currently not economical as a basis for petroleum replacement, ignoring the fact that scaling up the current 300,000bdp to 90Mbpd would require an industrial operation of unimaginable international effort. Let’s be reasonable about this. Assume that Corsi is correct. There is abiotic oil from deep in the earth. There is no claim that this AB oil is different from organic based oil, i.e., the implication is it feels, smells and acts like “dinosaur” oil. We can conclude from that, AB oil has the same or similar chemical composition (C and H in large stable ring-structured molecules). The depth of 10,000 feet is mentioned in the article, at which depth there would be very high heat and pressure. So, AB oil contains carbon and hydrogen and originates in an environment of heat and pressure. Sounds a lot like “dinosaur” oil, except that “dinosaur” oil is found at less depth and therefore must need less heat and pressure than AB oil. However, the wonderful thing about AB oil (as implied) is that Earth just churns this stuff out all the time, non-stop, so all you have to do is tap in and you get freeway culture in perpetuity. This latter leap of “reasoning” is where the whole thing becomes more like wishful thinking. Just because AB oil does not require any input from a formerly living entity (plant or animal)does not necessarily mean its formation takes any less time than the organic stuff. Even if the Germans could make it in a convenient human time frame (apparently with the help of a biotic called coal), that doesn’t mean the vast quantities necessary to run the world are also churned out in that time scale. Beside that, AB oil still has to be a recombination of ingredients (C & H) from a mysterious something and somewhere else. And as the underground rivers of AB oil grow, the C and H sources must be shrinking. Therefore, AB oil is not necessarily going to bubble from Earth faster than we consume it, and it cannot be infinite. Aside from that, at ten thousand feet, it’s probably not going to be cheap to extract, either. abiotic oil = complete BS!